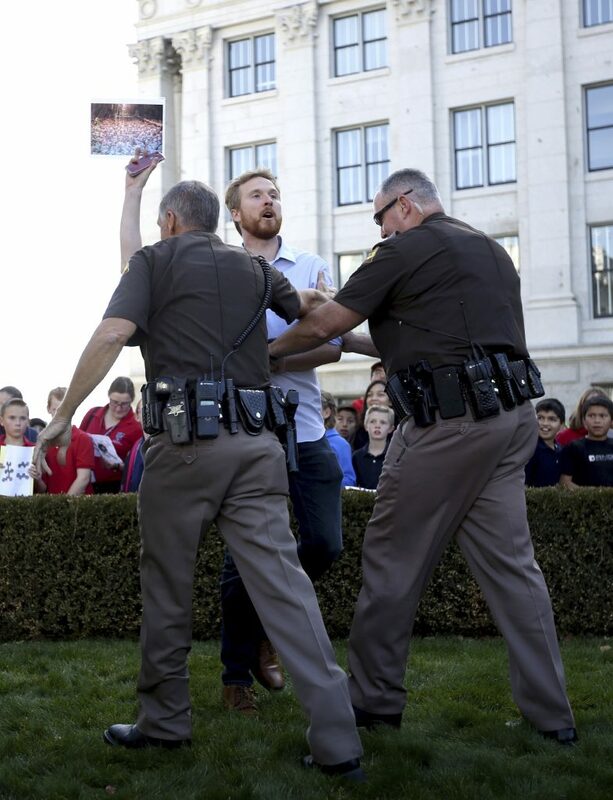 SALT LAKE CITY (AP) — Two animal-rights activists disrupted the Utah governor’s Thanksgiving pardoning of a turkey Tuesday, rushing the podium and shouting as the CEO of a turkey plant spoke to a crowd of mostly children. Video from KUTV showed Herbert’s security detail restrained the men and state troopers escorted them away from the afternoon ceremony in Salt Lake City. Utah Highway Patrol spokesman Lt. Todd Royce said the two unidentified men were not arrested but cooperated with troopers and left the Capitol. The men were demonstrating a day after activists released undercover photos and video showing injured, cramped, and diseased birds at Norbest turkey plant in Moroni. The group Direct Action Everywhere said the images and including documents showing animals with hepatitis and tumors were horrific. Norbest president and CEO Matt Cook said in a statement to The Salt Lake Tribune that the images were “disturbing” and said the company’s team had ask that farm’s to correct violations in the past. Herbert did not comment on the incident when he took the stage. Paul Edwards, a spokesman for the Republican governor, said in a statement that Utah expects farmers to meet the highest safety and humane standards. Nice thing to post on Thanksgiving, making us wonder if these Norbest turkeys are safe to eat. Good going news. Gobble gobble, enjoy your feast and family. Most of us enjoy meat products grown on factory farms. Beef, pork, and poultry. The end game for all these animals is the same. Our only expectation is that they are treated humanely during their lifespans. Genetic selection has zeroed in on the most cost effective way to create the desired meat composition, versus the feed given. Certainly not in the category of “free range”. We have seen plenty of video taped examples of questionable, and almost cruel treatment, of these animals. Norbest contracts with numerous growers, who are supposed to comply with operating standards for their farms. Norbest is responsible to consumers to ensure compliance with their standards, and cannot deflect blame. It is their responsibility, and we have to ask if they are taking it seriously. There are plenty of options when you tour the meat section of your supermarket. Choose wisely.